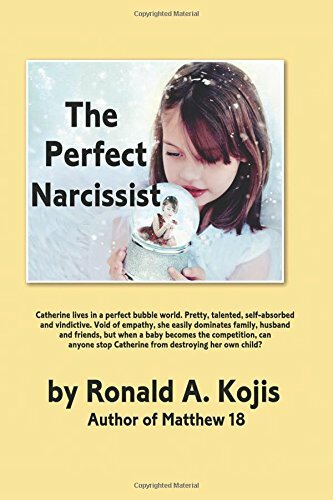 “The Perfect Narcissist” by Ronald A. Kojis follows a main character named Bunky, who is subject to emotional and real turmoil when the girl he fell in love with in college, (and eventually marries), begins to spiral out of control. Catherine looks like the epitome of the perfect girl. She is smart, beautiful, and talented. What only those closest to her see, however, is her destructive nature to herself and to those around her. “The Perfect Narcissist” has great details and dialogue. The story starts out strong and is intriguing, but as it goes on the pace does not seem to keep up with the author’s intentions. I was never quite sure just where the story was going. There was a lot of back and forth between Catherine and Bunky as they fight and make up over and over again. There also weren’t too many other characters to help flesh out the story other than Phil, Catherine’s best friend. The book seems initially targeted toward a young adult audience, but it does not truly find its niche there. Instead, it is somewhere between young adult and contemporary literary fiction. At first, you sympathize with Catherine because of how her parents are portrayed, a loving father, but a terribly condescending and vindictive mother who did not show much maternal love or support to her daughter in a way that would allow her to become a fully developed adult. The plot of this book is very psychological in nature, which is interesting. It’s easy to understand that what the author is trying to portray is a young woman with a sort of manic bipolar disorder. As a reader, you are torn between wanting to help her and wanting to cut her off entirely because each time you think she can’t do anything worse, she drops another bomb. In essence, the storyline of the book is well thought out, but perhaps could have been executed better. The characters are certainly unique and the portrayal of young life in the 1960s seems entirely realistic. I feel that just a bit more organization would have really helped drive it to where it needed to be – to help match the pace with the actions of the story and the flow of the author’s ideas. As such, “The Perfect Narcissist” by Ronald A. Kojis could be of great interest to any readers with a penchant for vintage plotlines or those who have an interest in psychology.